Walmart and Sam’s Club associates, customers and members in Indiana put their money where the miracles are during the annual Children’s Miracle Network Hospitals fundraising campaign. Indiana raised $939,787 for Riley Hospital for Children. The effort was part of a national campaign for Children’s Miracle Network Hospitals which resulted in $36 million raised, putting the national total raised since 1987 over the $1 billion mark. 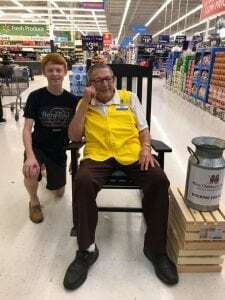 Donations poured in Aug. 27 to Sept. 30, as Walmart and Sam’s Club associates at 154 Indiana locations held various in-store fundraising activities and asked customers and members at the register to help kids live better. Customers and members could add a “Miracle Balloon” donation during checkout, with 100 percent of the funds going to Riley Hospital. Every donation stays local to help Riley patients like Owen Boatright of Plainfield, who is currently serving as Riley Hospital’s 2018 CMN Hospitals Champion for the state of Indiana. Boatright was treated at Riley following a dangerous complication from an E. coli infection that resulted in renal failure. Today, he is doing well and enjoys playing the piano and acting in school and community theatre productions. Donations from this campaign support the general benefit of Riley Hospital, an unrestricted fund to address the most urgent and emerging needs at Riley. These donations allow help to rapidly flow to the areas that need it most. This includes support for patient care programs like oncology and surgery team staff; advanced medical equipment; and funds for research at the Wells Center for Pediatric Research.